When you work with digital circuits, as we are in this project, it is often the case that two parts of the circuit transmit and receive a digital word, like a byte. The wires that transmit each bit of the word is a bus, and it can be thought of a a single bundle of wires. The keyword here is “single”. Instead of drawing the bus as seven seperate wires, we can draw it as a single wire. 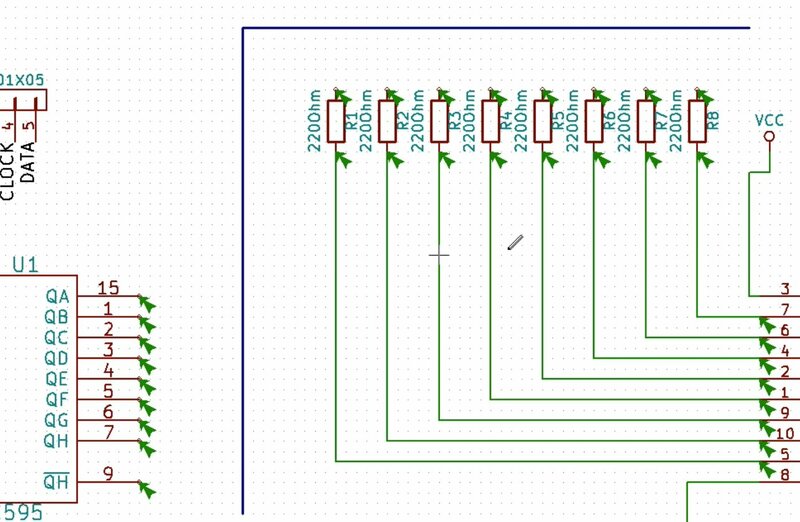 To show to the reader, and to Kicad, that this is a bus, not a simple wire, we can draw it thicker than a normal wire. 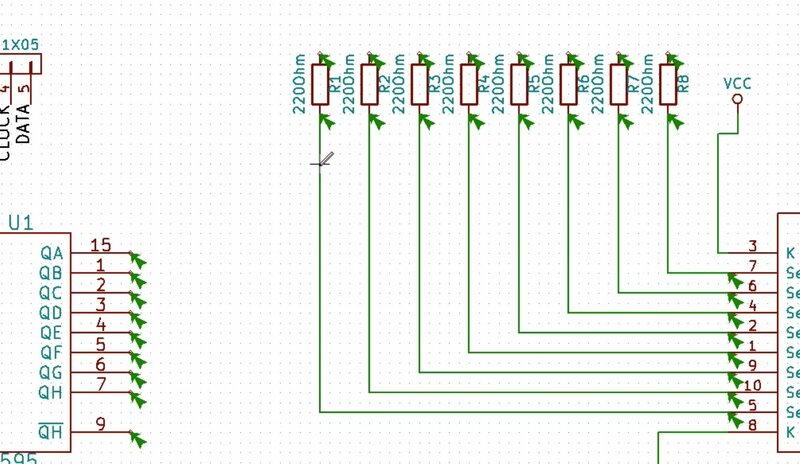 In this chapter, I will show you how to use a bus to connect the seven segment display to the shift register’s data pins. 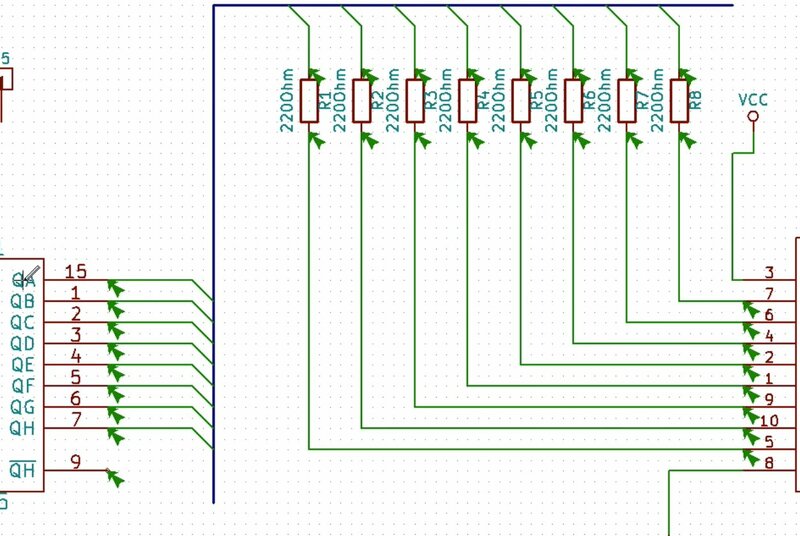 Let’s start by wiring the seven segment display to the resistors, the “normal” way: by creating individual wires. Nothing fancy here. The inputs of the seven segment display are connected to the resistors via wires. 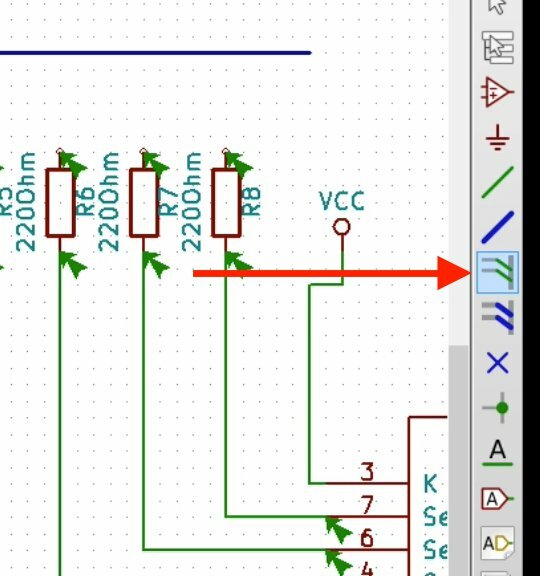 Now, we will use a single bus to connect the shift register IC data pins to the other side of the current limiting resistors. To do this, start by clicking on the bus component button on the vertical tool bar. The blue thick like is a bus. Nothing goes in or comes out of it at the moment. We will add entries and exits next. Next, let’s add the entries and exits to the bus. We’ll use the Bus Entries component for this task. Use the Bus Entry component to add entries and exists to the bus. The bus entries, added to the bus adjacent to the IC, and the exits over the resistors. The bus entries/exists connected to the pins. 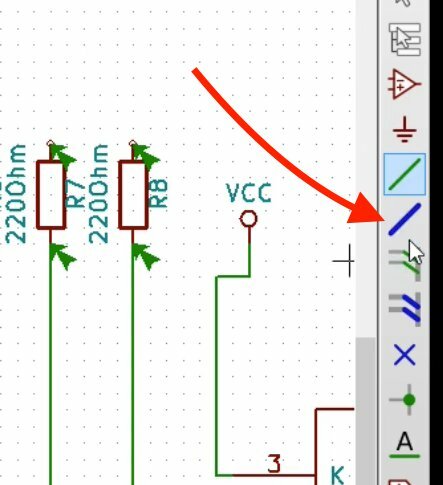 You may be wondering now, how does KiCad know that, for example, the QA or pin-15 of the IC is supposed to be connected to pin 5 on the seven segment display? 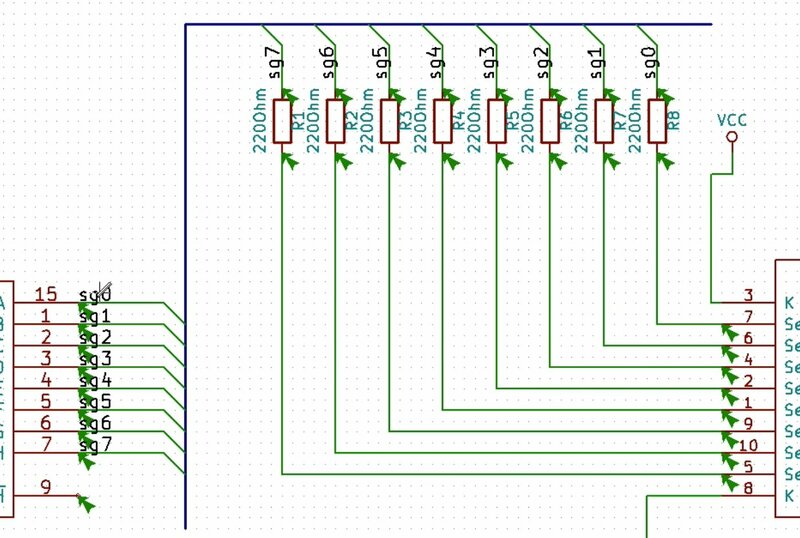 The answer is that Kicad doesn’t know unless you label both pins with the same name. To do this, we will add labels to all pins that are meant to be connected via the bus, like we did in the previous chapter. We have added labels to all pins that are connected to the bus. 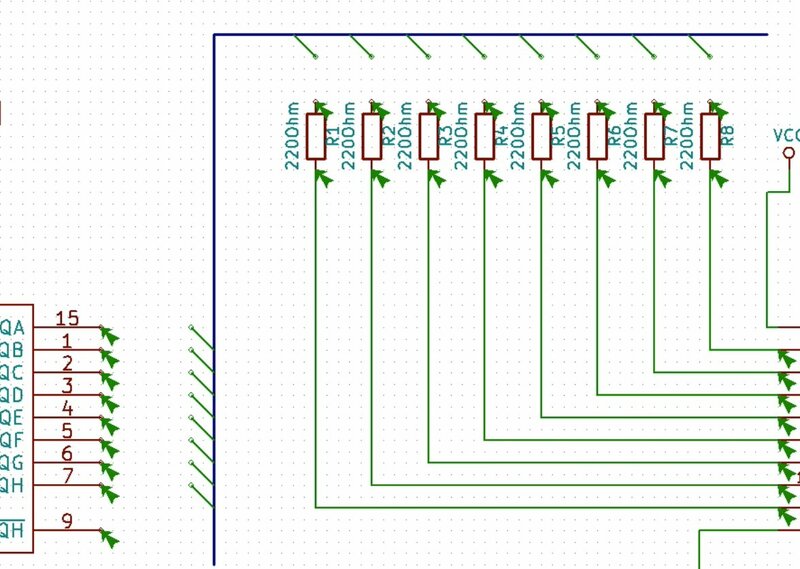 At this point, our schematic contains all data pins of the IC connected to the seven segment display, via a bus. The power wiring is also done, and so it the wiring between the connector and the IC. Notice that pin 9 on the IC is still not connected? In fact, we don’t want to connect it to anything. But, if we leave it like this, Kicad’s ERC will complain about it. I will show you how to deal with this issue in the next chapter.